To start, I must apologize, that I haven't managed to collect all types of kendamas we have imported till now, so the Shin-Fuji and Sakura are missing. Shin-Fujis will be in stock in a while and Sakuras maybe once too, though. First kendama I've ever seen was the TK16 Master. I've bought it on e-bay and it was quite expensive. 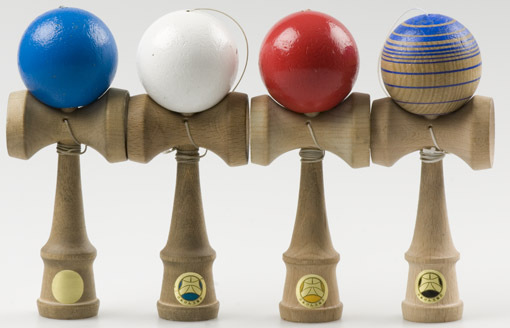 Kendamas were hard to get theese days and almost nobody knew what kendama even was. What was wrong about this one, was the fact, that the upper part started getting separated from the rest quite quickly. From tested kendamas, TK16 is made of the hardest wood and the colour doesn't peel off. I got Mugen kendama right after this one and it seemed to me definitely better. TK16 is not bad for the begginers, but it's nothing special. It's made in blue, red, black and colourless. Mugen is the second kendama I've ever had. It's weight is almost the same as TK16's, but it has slightly heavier ball. It's being described as the "Mercedes between kendamas", and it's definitely accurate. Mugens were being made in seven basic colours and two unique, which were the golden and vinous. It's a pity that they are no longer being made. I've read tidings, that Mugen fell out with Japanese kendama association and it stopped certificating Mugen kendamas. It doesn't change the fact that it's a great kendama though. Ozoras are quite similar to Mugens. They aren't made in too many colour variations, but their colours are uniqe, because no other kendamas are made in green and in that unique red tint as Ozoras are. They are really pleasant to play with. They feel like they are made from the same wood as mugens, but the colour doesn't happen to peel off, as it happened with mugens. Pice of this kendama is good too. Rokurosen has the biggest hole entry. Rokurosen is the lightest and most beautiful when compared to others. According to informations from Japan, Rokurosen stopped its manufacturing too. 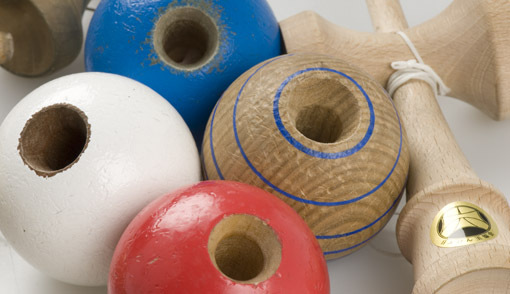 Its ball is not whole coloured, but has only coloured stripes, which makes it different and unique. I haven't seen it in any other internet kendama shop. Another difference is that it has bigger hole entry than any other kendama, as you can see in the picture. The first impression it made on me, was that it definitely is not kendama for me, because of its lightness. The colour design of this kendama is the thing that makes it most beautiful, but on the other hand it's its biggest disadvantage. For example trick Todai seems to be impossible doing it on this kendama, because the kendama keeps slipping off the non-coloured ball, but It's possible. This is the main reason why I wouldn't recommend it for begginers.Another disadvantage is its price, but for some addition money you get totally unique kendama and a keychain for free. So, I did the comparision, but the choice depends only on you. My poor old Mugen is quite cranky, so I'm switching to Ozora.I like it more and more and I think it's really a big deal. I'm really curious about Shin-Fuji though.